Tall Mom on the RUN: Is it half or full?? Half or Full?? I KNOW that I can do a half marathon (And will prove it on May 17th)....but will my knee, mind and body hold up to a Full 26.2? I am 8 weeks into a Rookie training plan and feel AWESOME, but maybe my body likes mileage less than 20?? Maybe I should just try to run a half marathon as fast as I can? "I AM GOING TO DO THE FULL MARATHON!!!" I did not say it so excitedly to Stan, but in my mind I jumped for joy. I made up my mind, email is out to race directors and although it may be a TOTALLY ambitious goal I am going to tell them that my race time will be 3:40 (BQ). I will be a Marathoner in 1 month 3 weeks and 1 day.. The Course Map...We will drive it in the next few weeks so I can get an idea of what kind of topography I should train for. Great work!!! It looks like you are well on your way!! This is so exciting! Glad the decision came so easily to you! I love Seattle... 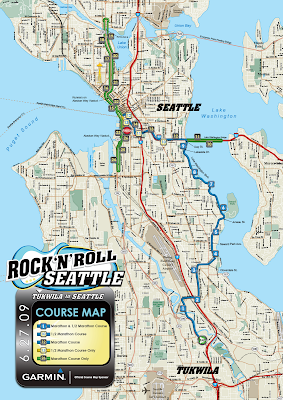 I should have stuck with my gut instinct and signed up for Seattle RR half instead of the San Diego RR full. Oh well, there's always next year. Way excited for you. Good decision! That's SO cool, and I love that the decision came to you like that! YAYYA! That is awesome. BQ, you can do it, you are SPEEDY!